Why do you want a 17-50mm f/2.8 ? If you go to photograph an important event (such as a wedding) and had to take only one lens, a fast normal zoom would probably be it. It’s the professional’s workhorse. In “full frame” terminology this typically means a 24-70mm F2.8. Such lenses are optimized for quality and speed. The 3x focal range covers the useful range of moderate wide-angle to moderate telephoto. The relatively fast F2.8 maximum aperture is available at all focal lengths. Expensive extra-low dispersion glass and professional materials complete the quality package. But many people can’t afford full-frame. And lets face it – today’s APS-C cameras have very good sensors, so all you need is to put a fittingly good lens in front of them. The closest thing for people like me with a 1.5x/1.6x crop factor cameras (e.g. Nikon DX, Sony NEX, Canon EF-S) are 16/17-50/55mm F2.8 lenses. To be precise on a 1.5x crop sensor camera a 17-50mm lens has similar optical characteristics as a 25-75mm F4.0 lens would have on 35mm “full frame” (read here for a short explanation on how this works). You would actually need something like a 16-50mm F2.0 lens to really give you the same performance, but since they don’t exist we have to settle for the F2.8’s. So the bottom line is that a 17-50mm F2.8 is the best quality all-rounder you can stick in your cheap DSLR’s lens hole. Despite their plastic exteriors, both lenses feel solid and well put together. Not indestructible, but solid enough. They’re almost exactly the same size, and weight (568g vs 569g, as tested). At the back both have metal mounts (as you would expect). Neither has a rubber gasket against moisture or dust. The Tamron has a 72mm filter thread and the Sigma a larger 77mm thread. Smaller filters are cheaper, but 77mm filters are something of a standard for pro lenses and therefore more versatile. As with most consumer zooms, both lenses feature inner tubes that extend when zooming from 17mm to 50mm. Luckily neither lens has a rotating front element meaning polarizing filters can be used without any annoyance. Both feature similarly sized, rubberized zoom and focus rings. The Tamron’s zoom ring was a bit too stiff for my liking. 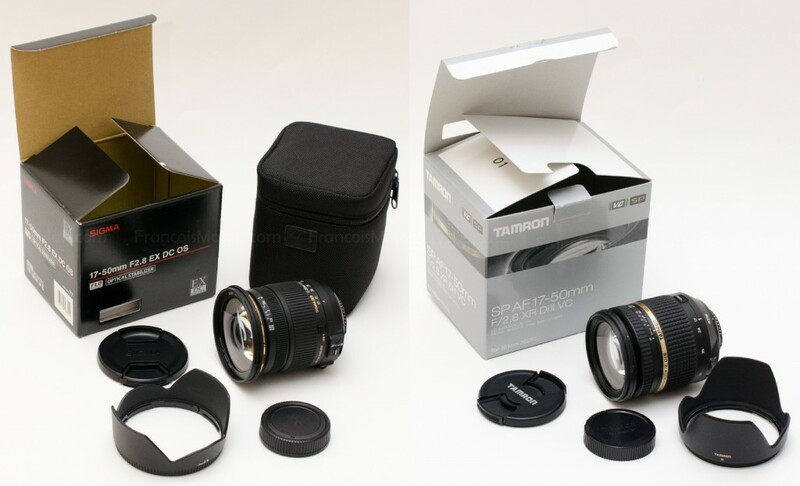 The Sigma ships with Sigma’s signature “EX” style zipped lens case that is great for travelling, while the Tamron comes without any protective pouch at all. Both lenses come with petal-shaped lens hoods. Analytical sharpness vs aperture charts for these lenses can be found on several websites so I decided to test them on a real scene, side by side. These shots were all taken with my Nikon D7000 mounted on a tripod, using 5 second self-timer and delayed shutter (to eliminate any blurring due to vibrations). The lenses had their stabilization systems switched off since they were tripod mounted. Phase-detect AF was used. Photos were taken in RAW and converted to JPG using Adoble Lightroom 4.1. I used identical processing settings for all photographs and didn’t use any lens correction profiles. The chosen scene was a parking lot next to the beach at Monster, The Netherlands. 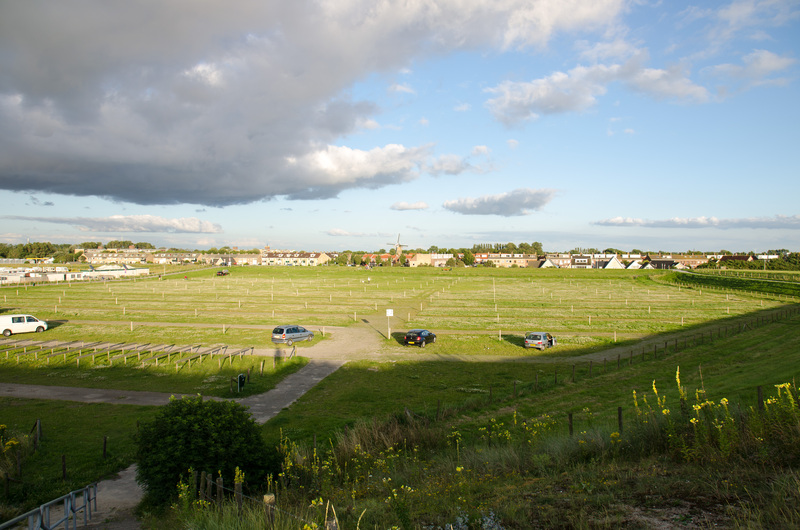 Below you see 1:1 crops from the original images, grouped by focal length and aperture. At 17mm f/2.8 the Tamron was a bit sharper. At 17mm f/4.0 both lenses performed better, with the Tamron still taking the lead. 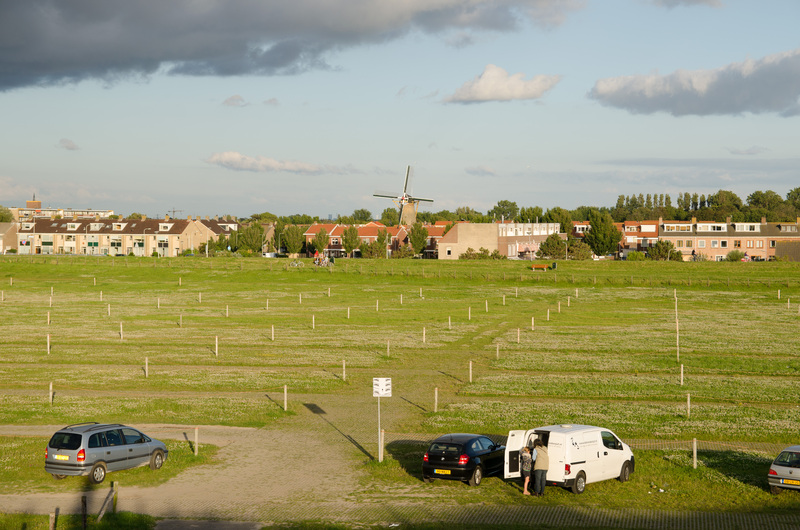 At 17mm f/5.6 the difference between the lenses more or less disappeared. Centre sharpness is excellent for both while the edges still lag behind somewhat. At 50mm f/2.8 both lenses show some softness, but the Sigma fares better. The Tamron has a distracting waxy glow to its images, even in the centre. At f/4.0 both lenses again improve significantly, and the Sigma maintains its lead. At f/5.6 the performance of the two lenses is again quite similar (just as at 17mm) but the Sigma maintains better sharpness in the centre and in the image’s edges. Both lenses have good sharpness and contrast when you stop them down to F4.0, and perform excellently at F5.6+. This is true for all focal lengths. Barring focus issues or camera shake you can be confident that your image will be decently sharp from corner to corner if you stick to these apertures – dramatically so at F5.6. But how do these two perform at their maximum aperture? After all, you don’t buy an f/2.8 lens only to use it at f/5.6+ do you? 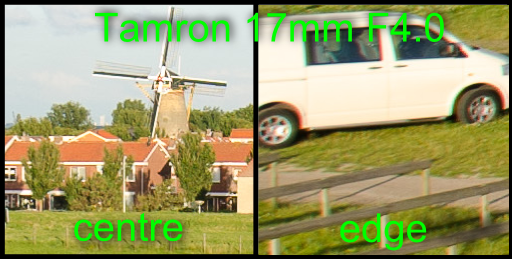 Here the Tamron performs well at the wide end (17mm), but things get a bit fuzzy at the the telephoto end (50mm) of the zoom range.The Sigma showed almost exactly the opposite performance as the Tamron. At the wide end (17mm) the Sigma’s focussing was intermittently unreliable (more about this later), and even when AF worked correctly the result it was softer than the Tamron. At 50mm f/2.8 the Sigma came into its own and delivered better sharpness and contrast. Vignetting and lateral chromatic aberration (colour fringes) are no longer such a big worry, since cameras are getting increasingly good at correcting this automatically / in software. Even if your (older) DSLR camera doesn’t have this feature, Adobe Photoshop and Lightroom do a great job at fixing your photos after you download them (especially if you shoot RAW). With both these lenses chromatic aberrations were well controlled, and not something to worry about in real-world use. More important is how well these lenses handle bright light (like the sun) hitting the lens from the front. This is something you sometimes can’t (or don’t want to) avoid, and if the lens screws up badly it’s almost impossible to fix the ruined result. Flare: shooting into the sun @ 17mm (click for detail). Note the bright “reverse vignetting”-like effect that both the Sigma, and to a lesser extent the Tamron, display at 17mm F2.8. 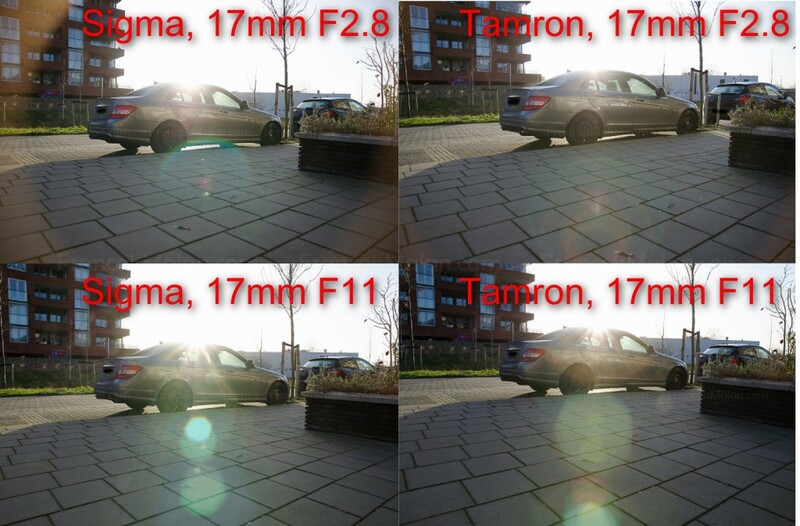 The two lenses perform similarly – at 17mm and F2.8 they handle contra sun reasonably well – the Tamron faring better here. At F2.8 the Sigma and the Tamron both show a “reverse vignetting” ghosting effect where the image corners are much brighter than the centre. This effect is more pronounced with the Sigma. In the above test shot I didn’t find it exceptionally distracting, but in subsequent use it turned out to be a problem in a some specific situations (see photo below). 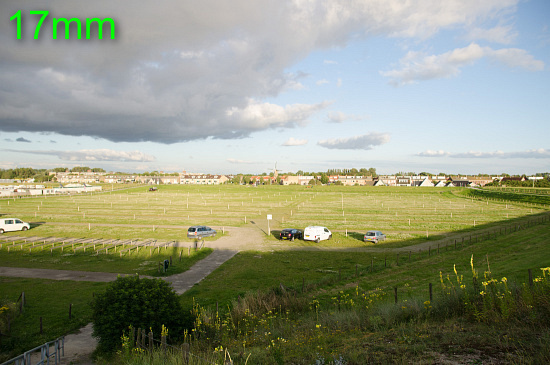 A “real-world” example where the Sigma’s “inverse vignetting” ghosting effect surprised me. As in the top-left test shot earlier, this happened at 17mm F2.8. Luckily this was the worst photo with most shots being better behaved (the effect is usually not visible, and can be anticipated through the viewfinder). 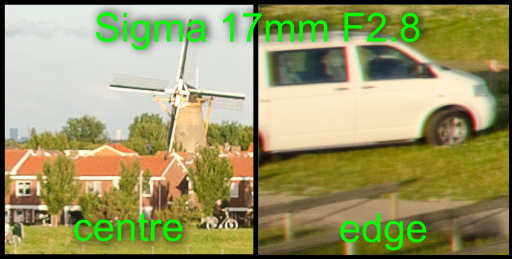 Except for the reverse vignetting effect of the Sigma which disappears, the contra-light behaviour of both lenses get worse when stopping down, showing strong flare artefacts at F11. Again the Tamron fares somwhat better although the difference isn’t all that great. 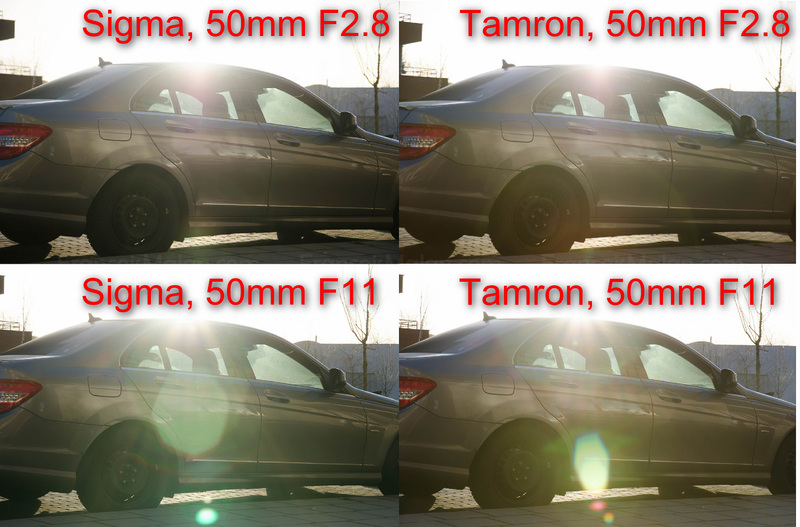 At 50mm the relative performances of the two lenses were more or less equal – the Tamron showing smaller but more intense lens flare. Regular vignetting (dark corners) was well controlled for both lenses at around 1stop falloff at F2.8, decreasing to 0.5 stops at F4.0. With a constant f/2.8 aperture these lenses can be used for limited depth-of-field portrait-type shots. The results are not as impressive as on full-frame – as mentioned earlier these lenses have similar optical characteristics as a 25-75mm F4.0 on 35mm “full frame” (short explanation here). Good “bokeh” (out of focus rendering) is however still an important and desirable feature of this type of lens. Here I happily report that both lenses perform quite well, and very similarly. The Sigma shows slight undesirable “onion ring” artefacts within the point spread disk, whereas the Tamron is smoother but exhibits more pronounced outlining and asymmetry. I’d call them equal. Both lenses feature built-in focus motors and therefore AF works on all DSLRs. Unfortunately neither lens offers full time manual override – you have to move the lens-mounted focus switch from “AF” to “MF” to decouple the focus motor. Failing to do this risks damaging the focus mechanism. Furthermore the focus paths of The Sigma and Tamron are both very short (~30° vs ~40°) – meaning that even if you decide to use it, manual focussing would be rather coarse. With both lenses the focus ring turns while auto-focussing. Personally this doesn’t bother me – I’m happy to rely on AF and keep my hands off the focus ring. 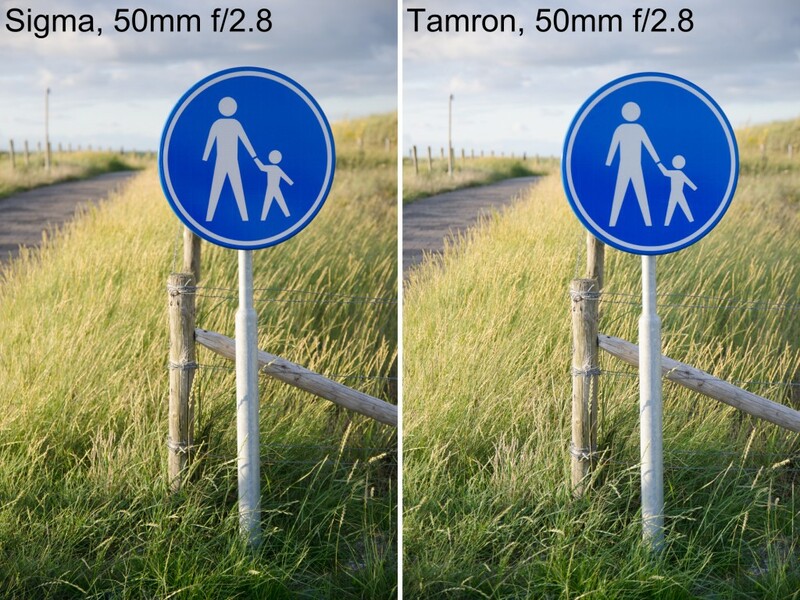 The Tamron uses a traditional micro-motor which is not especially fast, but accurate. Covering the focal range from 0.29m to ∞ takes about 0.6 seconds. Unfortunately it’s rather noisy and can easily be heard several meters away in a quiet environment, or during video recording. Luckily this noise is usually of short duration unless the lens has to cover the whole focus range (e.g. when focus hunting in dim light). The Sigma sports a silent “ultrasonic” type motor. Sigma calls this “HSM” and it is both fast and almost completely quiet. Covering the focal range from 0.28m to ∞ takes about 0.3 seconds. Mostly it is also accurate, but here I can’t be as positive as with the Tamron: The first lens I tested (in the shop) had a slight but noticeable front focus problem. I exchanged it for a second sample that tested fine on a focus chart. However I was disappointed to see that at wide angle and especially longer distances (> 10m) the AF was intermittently unreliable, randomly alternating between hit and miss. Furthermore this lens, unlike the Tamron, often missed focus using my Nikon D7000’s live view! This is very strange and unexpected since “live view” focussing usually succeeds regardless of a lens’ focus calibration. It seems as if the AF crosses the in-focus point too quickly for the camera to realise it, and then incorrectly settles on the wrong focus. Even worse than refusing to focus, the camera reported a focus lock but this was at the wrong focus distance. It could be that my copy was a dud – I am currently considering returning it to the dealer. 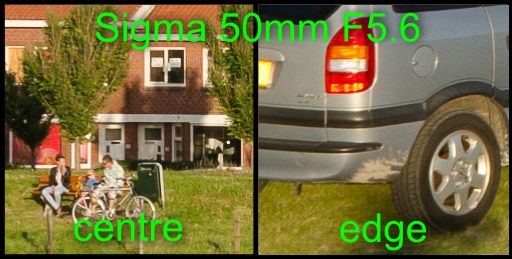 Another annoyance with the Sigma is that the lens’ zoom direction is anti-clockwise – independent of camera mount. Canon and Nikon use opposite clockwise/anti-clockwise conventions for zooming and focussing, and in this case Sigma’s choice matches the Canon convention. This means that you have to turn the lens in the “wrong” direction when focussing manually. While a seemingly small annoyance this causes frustration and missed shots if you’re used to all your other lenses working in the opposite way. The Sigma and the Tamron both have effective optical stabilisation, competitive with Canon and Nikon’s own IS / VR systems. Again we had a noise issue. The Tamron lens’ “VC” stabilisation was noticeably noisier than the Sigma. While not “loud”, it is clearly audible to the person holding the camera, and unfortunately also audible in movie clips. This makes the Tamron poorly suited to video capture unless you have a good tripod. To Tamron’s credit the VC performed well… slightly better than the Sigma, especially at the wide end. At 17mm I measured 3 stops improvement, while at 50mm it was equivalent to the Sigma, at 3.5 stops. The Sigma’s optical stabilisation (OS in Sigma-speak) is almost completely silent and performed well. Sigma claims 4 stops of stabilisation, but like with most manufacturers this seems to be a bit optimistic. At 17mm I measured it as only about 1.5 to 2 stops, while its effectiveness was noticeably better at 50mm where it gave me 3.5 stops advantage. To provide some perspective I also compared these lenses’ performance to Nikon’s 18-200mm VR – by now a classic, and a useful benchmark for VR performance. 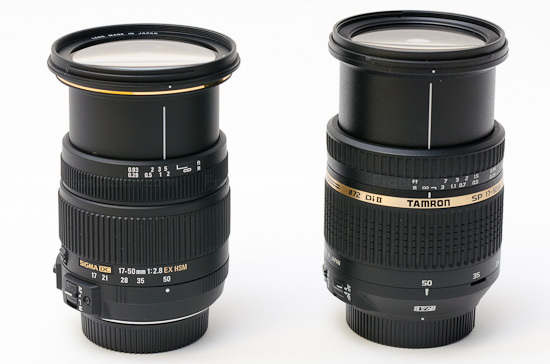 The Nikon rated similar to these two lenses – providing 2.5 stops at 18mm and 3.5 stops at 50mm. In addition to the Sigma and the Tamron, each of the big DSLR manufacturers have their own f/2.8 standard zoom offering. Canonites get the Canon 17-55mm F2.8 IS, Nikonians the Nikkor 17-55mm F2.8., Sony users the Sony 16-50mm F2.8, and Pentax users the Pentax 16-50mm F2.8. While these “brand-name” lenses all get good reviews, they are also all more expensive than the Tamron and Sigma. The Nikkor stands out as being the most expensive and bulkiest of the lot, while compensating with weather sealing and pro metal construction. The $1000+ Canon is the only one that also offers optical stabilization. On paper then, none of these combine the same value-for-money and specifications as the Tamron and the Sigma. I have personally used three copies of the expensive Nikkor. While it blew me away with its tank-like mechanical quality and focussing speed, it proved to be less impressive from an optical perspective. Two of the three copies suffered from pronounced field curvature (or corner softness) at 17mm. In terms of general contrast the Nikkor performed similarly to the Sigma and Tamron, while at its sharpness was similar or below that of the Sigma (especially at telephoto) and the Tamron (at f/4 and above). Just goes to show that a high price does not guarantee optical perfection. A stabilized 17-50mm F2.8 lens is a versatile and valuable addition to an APS-C type DSLR like the Nikon D7000, Canon 650D or 7D, Sony SLT-α650, Pentax K-5 etc. Both of the lenses reviewed in this article fit the bill. In the photo above you see that both these lenses pair up nicely (in terms of design and size) to a mid-range DSLR – my Nikon D7000, in this case. The Tamron performs better for wide angle (e.g. landscape) shots. And it is (slightly) cheaper. Consider, however, that you normally don’t buy a 17-50mm F2.8 lens only for landscapes, and you don’t buy it because it is cheap. If those are your main considerations you can better invest in a quality wide angle or a budget 18-55mm kit lens. With its quieter and faster operation and, especially, its markedly superior performance at 50mm f/2.8 (the setting you will most often use for portrait shots) the Sigma is the one I prefer. It is also a much (much!) better choice for video. Unfortunately on my camera its AF proved somewhat unreliable at wide angle – even when using live view. Stabilisation is essential for hand-held video, and here the Tamron’s VC stabilisation is just too noisy (unless you have an external microphone). The Sigma’s AF motor is inaudible, but the Tamron’s is so loud that you cannot use it stealthily in quiet environments, and not at all during video (unless you use an off-camera microphone). Ultimately I found both the Tamron and the Sigma to be quite good, but neither convinced me in all respects. They represent two of the best third-party offerings and have all the features you expect, but each had weaknesses that made me doubt whether I would “get the shot” every time. In the end the Sigma ended up as my general purpose workhorse and I’m quite happy to report that it serves me well in everyday use. Just watch out for the odd focus error or ghosting artefacts against bright lights. My pick between these two is the Sigma 17-50mm F2.8 EX DC OS HSM. Be aware of its limitations though. A lens in this category should be all about quality. Especially at 17mm it has some issues that can interfere with crucial shots. That said I’ve personally used this lens for assignment work and generally have been very happy with the results. Great review! I’m looking at the Sigma 17-50. Havent tried the Tamron yet. Your samples for sharpness are rubbish imho. I guess you did something wrong with your setup (wobbly tripod? focus?). 1st sample: Sigma@5.6 is as sharp as Tamron@2.8? unlikely. 2nd sample: Sigma is significantly sharper at 2.8 than both lenses at all apertures? I doubt that! The rest is ok but I think Tamrons VC works great for video. Even Chase Jarvis used this lens for video for that reason. @nerevar These are the results I got, and I believe that they are representative for the samples I have. You will notice that even big review sites that have access to several samples get intra-sample variation. I describe what I see. I still have both so can do a re-test at some point in the future. It does seem that you have a vested interest in the results by calling them rubbish. Do you own any of the two? I think this review is great! Thank you for taking the time for putting up such a detailed review. Thank you so much for taking time to write this review. It’s very helpful! I own a Nikon 18-200mm but want to get a better/sharper picture at the wider end so I am considering either Sigma or Tamron. If possible, could you please comment on the image quality difference between Nikon 18-200mm (of course between its 18mm to 50mm range) vs. Sigma/Tamron? Hi Peter. 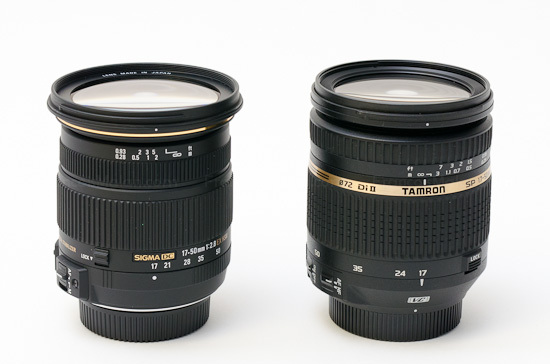 I own the Nikon 18-200 as well, and have shot these lenses side by side. The Nikon performs well – especially at 50mm. I think that the difference at 50mm is negligible for where the lenses’ parameters overlap (i.e. F >= 4.0). At 18mm the Nikon has a bit more chromatic abberation and more distortion. The biggest advantage to these lenses is their ability to shoot at F2.8, their supposedly faster AF and the better bokeh @ 50mm. I plan to expand this review in the future – want to add a short video review also. Thanks a lot for the feedback. Definitely agree on these lens able to shoot at F2.8 compared with the 18-200mm. I ended up getting a used Tamron, and it’s working great so far. However I find the VC noise quite annoying, so I have it turned off most of the time unless I really need the VC feature. I also read reviews many places about how the slow VC may potentially get your blurry shots if you didn’t wait for it to settle. Overall it’s a great lens for the money I paid. Thanks again for taking time to respond to the comments! Man, I am in the same boat. Loved the 18-200 on my D200/300, but it is disappointing on the D7100. So true. Could you please give the comparison of Sigma 17-50 with Nikon 16-85mm. Both lenses sells for almost the same price. Nikon has better quality control but please advise which one should i get. Unfortunately I don’t have a Nikkor 16-85 to test. But here is my opinion: Even though they cost approximately the same, the Sigma 17-50 and the Nikkor 16-85 are two different beasts. The Nikkor has a greater zoom range but is not constant-aperture or F2.8. For me and many others F2.8 is essential for enabling lower ISO in dim lighting, and for creating better bokeh at a given focal length. 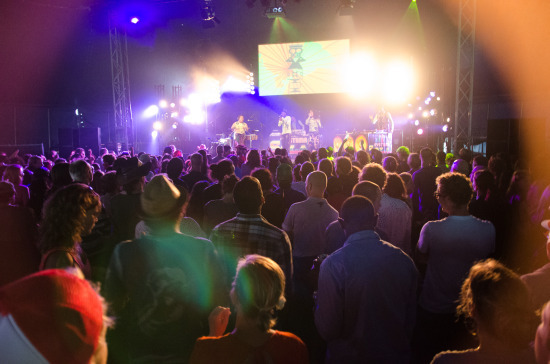 So if you’re going to shoot indoor events I’d recommend the Sigma 17-50. The 16-85 is a good lens and maybe better suited as a general-purpose lens – especially for outdoor use. Thanks for the reply. Actually I order this lens and tested on the field. There is some focusing issue. Sometime lens focus on the background rather than subject. Sometimes it is correct. Is this lens going to behave in same ways. Is my copy of the lens is bad ? Do i need to calibrate the lens with my D7000. I am confused right now. Even if i replace my copy how this lens will behave in long term. Please advise. Dear Munish – which lens did you order in the end? Focussing on the background instead of the foreground is probably something the camera body does, not the lens. The camera selects the focus point(s) it uses. Do you have automatic or manual focus point selection enabled? Do you use live view or the built-in phase detect system to focus. Sounds like a possible focus issue of the lens – but to make sure you should use a focus chart. Google it – there are many examples online. Faces are more difficult subjects for testing since they may move and have less detail (depending where you focus). I also observe similar focus issue. I always blamed myself for not getting the focus right. But I never had this issue before with other body and lens. I’ll drill down in testing with my other lens on my D7000 later. Thanks for the review. I have used the older non vc tamron 17-50 on several nikon bodies d40x, d60, d300, d3100 and my current d7000. I believe this older lens is optically better than the newer version and there are several reviews supporting that data. I am also a fan of 3rd party lenses, i own several tamron and sigma lenses which give you ” good bang for your buck ” as compared to the more expensive nikon high end lenses. Thanks for the info, d7kshooter. Did you ever have issues with field curvature on the non-VC Tamron? I read that it may be an issue. Here in Europe the price diference is 200 euros (379 and 589), would you still recommend it. I’m in Europe too – price difference depends on seller, of course. For 200 Euros cheaper the Tamron is better value for money, for sure. You just have to decide how you want to use it. If you shoot a lot of video I think you’ll find the noisy motors a deal-breaker at any price. But the Tamron is a good performer except for 50mm F2.8. As you can see, the difference is huge. I’d like to buy Pentax k-30 that has inside stabilisation so I think I will choose tamron without VC since it’s not needed (am I right?). The price is €325. Would you recommend anything else for k-30? Is it much better that the kit lens? 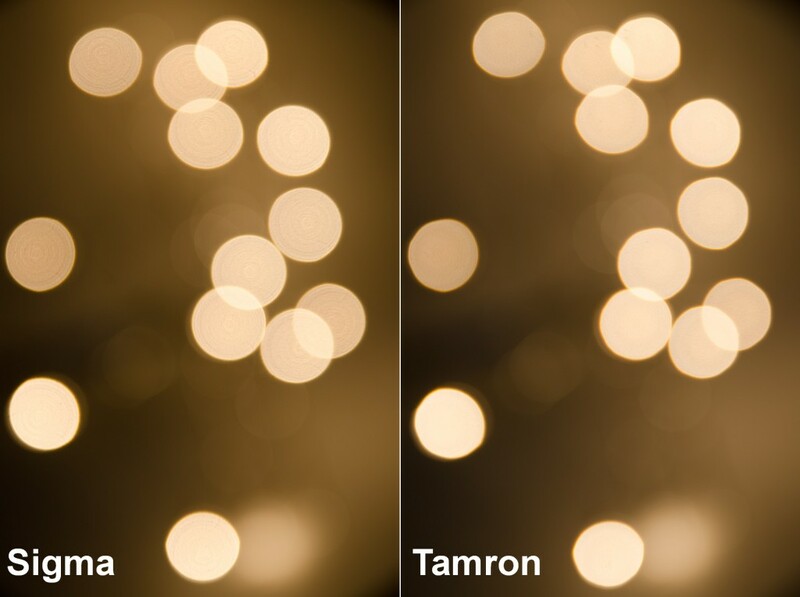 Of course, the light is better in tamron. This has to be one of the best reviews I’ve read. After reading your excellent review it will have to be the Sigma. For special purposes where sharpness and speed are paramount, I have the very excellent Pentax FA 31/1.8. If only it were a zoom! Thank you, Tim! Great to hear that my review helped! If only someone made a perfect lens then reviewers like me would be out of a job. But as it is the situation is so complex that one needs to do research to figure out what the best options are. what a awesome review… honestly you should be awarded… this is quite quite informative top to bottom…. thanx a lot. I was greatly confused between these two lens now I have more reasons to buy a sigma. thanx you are great! hi again, well can u just tell me is the sigma sharp enough for its widest angle at 2.8 for portrait…? Portraits at 17mm, F2.8? That is a little bit unusual, but I guess it could work for environmental portraits. I personally don’t use the Sigma for portraits at this setting. IMO it is sharp enough, but please also check other reviews for guidance. Actually, I got my Sigma 17-50 f/2.8 OS (Canon mount) mainly for environmental portraiture. My girlfriend’s (and her fellow performers’ musical “gigs”. And, not infrequently, the portraiture is done near the wide end. Since then, it has become the lens that stays on the camera unless I need to go outside its focal length range. Good review. Your findings on the image quality of the Sigma pretty closely match mine. I can’t comment on the other lenses in the caregory since I haven’t used them. I’ve never had any problems with AF, but I’m using Canon bodies so that may (or may not) have something to do with it. Maybe Sigma did a better job in hewing to the Canon camera-lens communication protocols than to the Nikon ones. I daresay neither of us has any way of knowing that for certain. I own a Tamron 17-50mm non VC version. After analyzing your review, I will buy a Sigma 17-50mm OS..
Hi thanks for the great review. (Some of your pics are showing in the wrong places on my ipad though). I have bought the new Nikon D5200 and am looking to replace the kit lens 18-55mm so I guess a lot of people ask the same questions. I also notice that Sigma (refer Sigma website) will soon have a 17-70mm f2.8-4 in Feb 2013. I’d be interested to see how this compares with the current lineup. Tested 3 different copies of the Sigma, all were optically great but again every single one of them had the characteristic phase-detect center-spot autofocus inaccuracy/unreliability at focal lengths shorter than 28mm. Liveview contrast based focussing was significantly better, tough painfully sensitive 10x manual focussing produced best result. For clarification, none of these lenses produced any front or back focussing in focus chart tests. All these led me to believe that the inaccuracys is a design issue inherent to the lens rather than bad copies… Great review btw ! What Mount? The owner of the site seems to have had some with Nikon but I’ve had none with Canon. It might be that the recommendations need to go on a mount-by-mount basis. You haven’t commented on the non vc verse of Tamron.Also the sigma doesn’t have any considerable difference between it’s models,Rt? I didn’t test the non-VC version, but it is reported to be sharper than the VC version. It is also smaller and cheaper. You’d have to look at other reviews. Afaik the Sigma OS model is optically different from other models so you can’t assume that they’ll perform similarly. I was searching for a long time a “real-condition” test rather than a theoric (with pattern unreadable) test ! It’s clear that main (only?) interests of these lenses are low-light conditions (church etc) and better bokeh. I’ll bought one because i’m fed up with my 18-105 mainstream lens, overcome in term of bokeh (portrait) by simple ‘integrated lens super zoom APSC’ (don’t know the name in english!). I also have the 35mm/1.8 Nikkon, exceptionnal… why not such quality in a 16-85mm low-cost !! ;o) I dream I know. Thorough and neutral review. Thank you for posting. I found your article by chance, as I was looking for review on this 17-50 Sigma OS HSM performance in video. Actually I am ownin g the Tamron and I am quite satisfied with it. But the price of the Sigma lowered to € 369,- in Germany, which is realy cheap for this lens. Perhaps I give it a try. Thanks for your thorough comparison, Francois. One small correction – Nikon camera bodies do not offer distortion control with non-Nikon lenses – that menu option is grayed out when third party lenses are attached. Thanks for the correction. Luckily Adobe Lightroom does provide distortion correction to Sigma lenses also. Focusing speed is somewhat slow on this lens if compared with lenses which have USM motor. 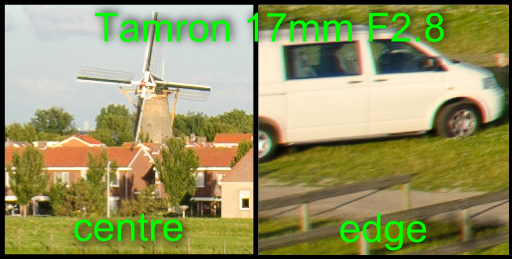 In comparison with Canon 18-135mm lens, Tamron seems to be focusing little faster sometimes. Great review, a proper review, with a conclusion! Other reviews outlay a bunch of data and don’t come to a decision, its so frustrating. I think I may go in for the Sigma. The last sample (real world use) shows Tamron a little softer than Sigma and with a little less soft background bokeh at 50mm f2.8. There is an explanation for thd. 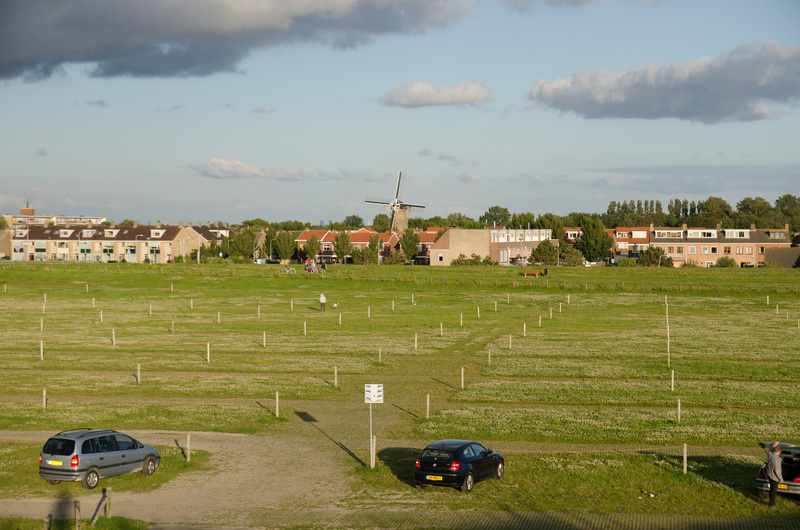 Check the wood poles, particularly the left one, the grass at its base and the departing wire. Ais other than the image quality. Look close and you will see that the Tamron is focused a bit behind the subject, which creates exactly the two problems describelso the grass in front of the subject is out of focus on the Tamron due to the same cause. There is an explanation for this, other than the image quality. Check the wood poles, particularly the left one, the grass at its base and the departing wire. Look close and you will see that the Tamron is focused a bit behind the subject, which creates exactly the two problems described. 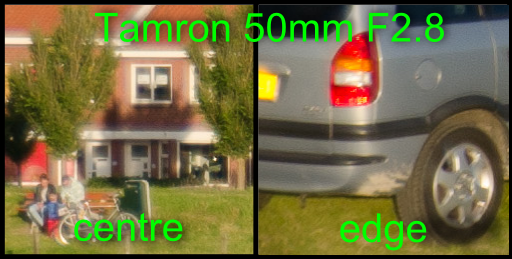 Also the grass in front of the subject is out of focus on the Tamron due to the same cause. (Sorry for the last comment, please erase it). 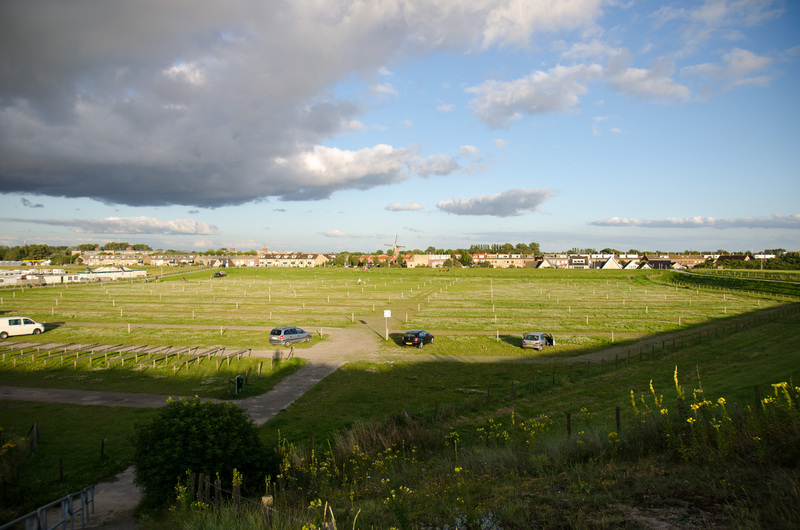 Also the Sigma is slightly underexposed which makes it harder to judge contrast and color difference between the two. Could you remake the test with the same scene as this can be a good head to head comparison, please? Also you could shoot a different test with vivid coloured subjects (real-world objects with large vivid red, green, blue areas) to see how they compare in reproducing colors and making images pop. The reason why peolpe buy Sigma,Tamron and Tokina is because there much cheaper than the Nikon.I have﻿ the Nikon 10-24mm and it is the sharpest lens and expensive out of the 5 lenses,always buy the best if you can afford it. Thanks for this great review. Being still rather new to photography but having bought a Sony A58 I’ve been agonising over whether to buy a slightly better 17-50mm to replace the kit lens or to get a true wide angle (which I haven’t used before), as I have the Sony 35mm and 50mm 1.8 lenses already. These may seem a bit redundant considering the overlap in focal length but I like the sharpness and larger aperture a prime offers as I like to shoot street scenes, handheld interiors and am getting into portraits a bit. So, while I still haven’t decided, your article *has* helped me decide to *not* buy a kit lens replacement. A have just bought the Sigma 17-50 for my Canon. So far so happy! It’s a great review! I just bought a Sigma 1750 and it works very well. But I have a concern about it’s mechanical quality. How about your Sigma right now, is there any quality issues, gears aging or something? Seems Sigma mechanical quality is not very good. No issues yet. I’d also say that the Sigma and Tamron feel about equally well made. Thank you for that very thorough review of these two lenses. I currently have the Sigma 17-70mm Contemporary but I’m trying to get my head around whether or not I’d be better off with one of these for the constant f/2. I want a general walk around lens that’s also good for portraits and I’m unsure which of the two would be better for isolating my subject. It’s the choice of 70mm @ f/4 with my current lens or 50mm @ f/2.8 with one of these. It’s a toss up between longer focul length or wider aperture ss the background is usually more pronounced at longer focul lengths. Would there be anything seperating these two lenses? Thank you for that very thorough review of these two lenses. I currently have the Sigma 17-70mm Contemporary but I’m trying to get my head around whether or not I’d be better off with one of these for the constant f/2.8. I want a general walk around lens that’s also good for portraits and I’m unsure which of the two would be better for isolating my subject. It’s the choice of 70mm @ f/4 with my current lens or 50mm @ f/2.8 with one of these. It’s a toss up between longer focal length or wider aperture as the background is usually more pronounced at longer focal lengths. Would there be anything seperating these two lenses do you think? Thanks for your interest and compliment. There are online depth of field calculators that can help you; google “depth of field calculator”. At a given distance, e.g. 3m, the 70mm f/4 will have a shallower depth of field than 50mm f/2.8 (e.g. 29cm vs 40cm at 3m). But you will be zoomed in more at 70mm, resulting in a different framing between the two. Moving back further with the 70mm to get the same framing, you’ll have to stand at 4.2m distance, resulting in a depth of field of 57cm — more than the f/2.8 at 3m. Another factor to consider is the quality of the bokeh – I don’t know how well the 70mm lens fares in this regard; reviews seem quite positive though. Lastly, 70mm might give you a nicer perspective for portraits as longer focal lengths are generally more flattering to faces. In conclusion, the 17-70mm f/4 might be a better and more versatile overall portrait lens, but the 16-50mm f/2.8 will give you better subject isolation for a given framing. If you shoot mainly in a studio I’d suggest the 17-70 as the subject isolation is less important (you’ll be using a backdrop). Outdoors the 16-50mm might be better for isolation, but also has less range. Thank you for taking the time to answer my query Francois. That reply has made quite a few things make sense to me now. Thanks again! Wonderful samples of your work.I bhuogt my SD14 last year, later a DP1.Your site was from day one I owe my Sigma a great source of inspiration to me.Your art gave me the last kick not give up the fight with the foveon.It’s really worth the struggle:-)I hope you’ll have the time to keep this site alive. Great review and very thorough. I’ve just bought a D7100 and ordered a Sigma 17-50 mm F2.8. The camera place tried selling me the equivalent Tamron but it cost almost 50% more so thought I’d be missing out on something. After reading your review I’m now even more sure I made the right decision to stick with the Sigma. Now I just have to wait for it to arrive! A very good comparison review. I already owned 50mm f1.8 and thinking of getting sigma 17-50mm. The former is a prime lens so I’m not sure if I should be getting sigma 17-50 or something else. I’m 550D user. Appreciate if anyone could help me out. Thanks…TH. A zoom lens is really much more versatile than a prime, and the image stabilization is useful too. If I was a Canon user, I’d seriously consider the rather excellent 17-55mm F/2.8 IS instead of the Sigma, unless price is a serious consideration. The performance should be similar, but the risk of autofocus issues should be smaller witht the Canon, plus it has an extra 10% range at the long end. For a Canon T2i would you say a Sigma or Tamron. Also now for 70-200 or more which the alternatives to a canon…. My advice doesn’t really depend on the specific body. I would prefer the Sigma. I’m using a d7000 too. Is there a work around for the sigma 17mm focusing issue? Planning to purchase this lens to have a wide angle lens + good apperture of 2.8 all the way. If you have alternatives work around, i would really appreciate it? 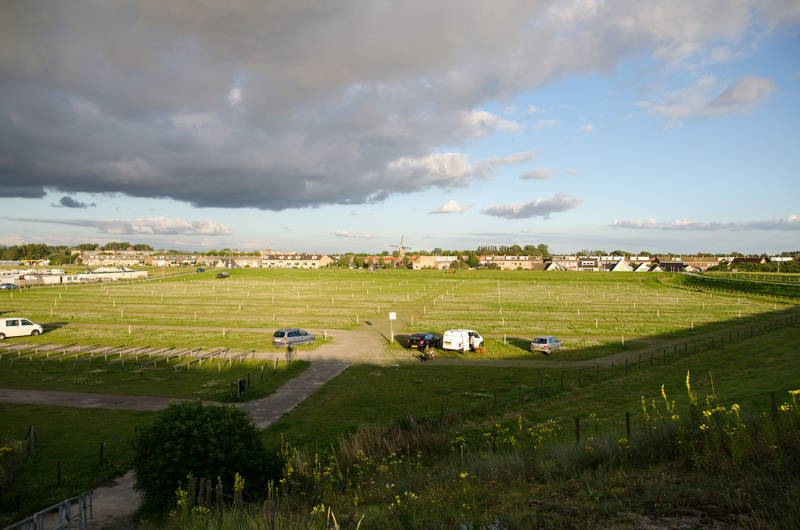 How about 18mm – up, is there any focus issue? Great comparision test. Thank you ! Man, that’s a really good review! Congratulations!! You really answer all my doubts about how to buy for my Nikon d7000. I’m a wedding photographer and have a little budget, so Tamron and Sigma are a good lens for me. Hi, man. That’s a good review. 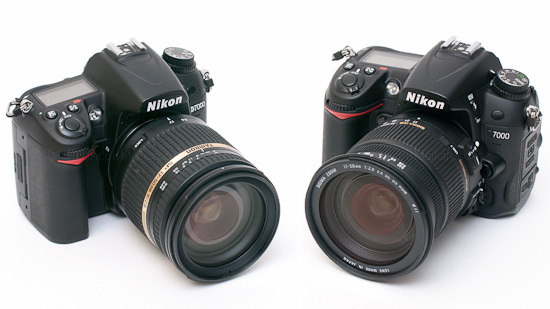 I’m thinking of getting one of them for astrophotography, which one I should go for? P.s. I have consider and try the tokina 11-16mm f/2.8, but it back focus effect is not favorable for some of my daily shoot. And I will gonna stick it on my new D7200 for quite general purpose, as my D90 will stick with my Nikkor 50mm f/1.8g. Please suggest one for me. Thanks. Thanks! For astrophotography I’d still suggest a wide lens like the 11-16mm, just because you can get more dramatic shots of the milky way. I guess that’s what you mean (and shot photographing through a telescope, in which case you don’t need a lens at all but just an adapter). That said, the Tamron may be slightly better for your astrophotography needs as it performs better at the wide end, while you won’t really be using the 50mm end of the range for that goal. Hi, I just got a Canon 1200D as a present with 2 kit lenses. I want to travel this summer with my new camera and was looking at the Sigma because it’s half the price basically. I want to be able to take better pictures in lower light – right now my 1200D at f 3.5 in sunny Spain isn’t that good unless I really jack up the ISO, adding noise significant noise. Could you recommend either a zoom lens for under 350 euros or a prime lens that’s much cheaper? I would prefer a Zoom lens, that way I can just take the 1 lens with me while traveling for 99% of my shots. The other lens I considered was the Canon prime lens 50mm 1.8 stm, but on a cropped sensor, 50mm is actual more similar to 85mm, which is far too zoomed in for street photography and the 35mm lens is WAY too expensive for my usage for a prime lens! It is tough to recommend a good lens for less than 350 Euros; if you’re lucky you can get the Sigma 17-50 for this price. There are really not so many cheap fast lenses on the market. If you want something fun there is the Canon 24mm f/2.8 STM that is suuuper compact and captures a bit more light than the 18-55, but not all that much. It also lacks stabilization. I’d suggest getting a 50mm f/1.8 and sharpening your skills within its limitations. I just ordered the Sigma for only € 299,-! I used a sigma 17-50 in 2014 and the backfocus issue was a nightmare. Then I started reading that the d7000 has not a reliable focus system. Have foi tried the lens on a different body? From your review, I understand only one thing. Tamron is better in a few aspects, Sigma is better in a few, overall you would prefer Sigma, but seeing at the samples, we should not buy any of these!